Each Summer the CYO rallies children and families together from all counties to travel to the Disney ESPN Wide World of Sports Complex to compete in the Track & Field Team Championships. the top 6 qualifiers from the County Championships are eligible to travel. Any Team CYONY alumni are automatically eligible to return with the team. This is an opportunity for our CYO athletes to experience strong competion built around a fun family trip to Disney World. Over the years, Team CYONY has had great success. Just this past summer we had team members set new meet records and qualify to attend the Junior Olympics. The Track and Field Club Championships will be held the week of July 9th - 14th, 2018 at ESPN Wide World of Sports Complex in Orlando, Florida. Of course, no one is obligated to go to the Florida meet. Deadlines for registration and room reservations can be found below. Please note that every child must be accompanied by a parent or guardian, no exceptions. The CYO will make all arrangements to enter athletes in their events. CYO officials will be on site in Florida to coordinate our athletes’ events and practice sessions. No athlete will be entered in a multi-event (pentathlon, etc.). Free time will be available. The expenses are the responsibility of the athlete and his/her family. Qualifying For Team CYONY: the top 6 qualifiers from each county are eligible to join Team CYONY at Disney World. Any Team CYONY Alumni are also eligible to return to Florida with the team. Please be aware that if you qualify and decide to participate in the AAU Track and Field Club Championships, you will be contacted in early June regarding team practices. Athletes are expected to attend practices in order to be prepared for the Florida Meet. Team CYONY Track Uniform for athlete. Team CYONY T-shirts for family members traveling to FL. Facility Fee (s) for Team CYONY practices leading up to championship. Contact Seth Peloso 646-794-2050, ) expressing your interest to join Team CYONY in Florida. Attend the Informational Meeting more convenient for you in Westchester or Staten Island. confirm “YES or NO” you will attend the Club Championship meet. For your convenience, there are three options with your accomodations. Please note that the Pop Century Hotel will serve as the CYO Headquarters for TEAM CYONY. Don't wait, these hotels fill fast. *Shuttle bus provided to ESPN track complex from these 3 hotels. Practices will be held on Staten Island, Bronx/Westchester and possibly Manhattan depending on entries. CYO will begin registration for Team CYONY. A copy of the athlete’s birth certificate must be in our hands before this date. You may also upload the Birth Certificate during the online registration process. First team meeting at Pop-Century at 8:00pm for athletes starting competition on Tuesday. First possible day of competition. Second team meeting at Pop-Century at 8:00pm for athletes starting competition on Wednesday. Do I have to book with Disney Sports Travel or Anthony Travel? No you do not, you are welcome to make your own arrangements. When should I plan to arrive in Florida? The day before you compete. Tuesday, July 10th, 2018 will be the first possible day of competition for our athletes. Some athletes will start on Wednesday. 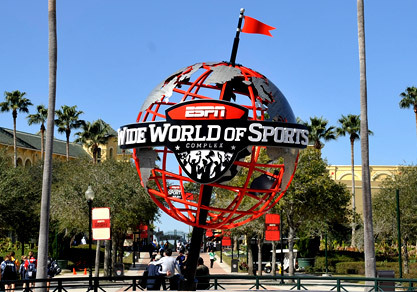 We will hold a Team Meeting at Pop-Century on Monday, July 9 at 8:00pm for those athletes competing on Tuesday and a second meeting on Tuesday, July 10 at 8:00pm for athletes starting the competition on Wednesday. At this meeting we hand out the team uniforms, t-shirts for the family, and review the event schedule. Arriving Monday would play it safe. Plus you can have a day to enjoy Disney if you don’t start competing until Thursday. How long should I book my stay? It depends on if your child qualifies for final competitions, which are held on Saturday. The Last possible day of competition is Saturday, July 14. Yes, The Draft DISNEY Meet Schedule can be viewed here. When Do I need to make a commitment by? If you would like to attend a meeting and learn more before you make the commitment, we would need to know by Thursday. June 15th. Yes, a practice schedule will be set for locations in Westchester/Bronx and in Staten Island for the month of June. Do I need to rent a car when I get to Florida? The Pop Century and All Star Sports resorts provide free shuttle service to the Athletic complex. Also, i fyou stay in disney properties, they provide a free bus service from the airport to your hotel when you arrive and depart.